Want to Learn to Shop Smarter & Scam-Proof Your Life? 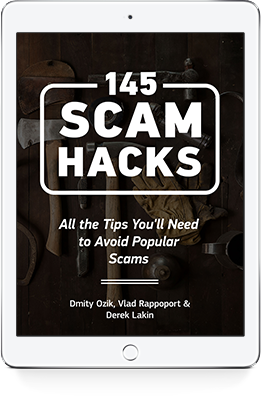 Join 3,000,000+ HighYa readers who receive weekly how-to guides, tips & reviews and get a FREE COPY of our 145 Scam Hacks e-book. Enter your email below to get started! At HighYa, we’ve written extensively about all types of scams, from anti-aging and “As Seen on TV” products, to scams targeting students and seniors. What have we learned? The best way to fight back is by arming yourself with as much information as possible. In other words, by learning exactly what to look for, you’ll be able to identify scams with ease and avoid them altogether. And that’s exactly what this book is: An easy-to-read guide that can help you avoid many of the most popular scams. So read up, fill your beautiful brain with information, and help make a scammer’s job as difficult as possible. Did you download 145 Scam Hacks? If so, tell us what you thought by writing your review!